DreamStation offers a sleek, low-profile design. Its vibrant color screen displays daily progress and features easy-to-use menus. Auto BiPAP features C-Flex, C-Flex+, Bi-Flex SmartRamp EZ-Start CPAP-Check Digital AutoTrak Advanced event detection Waveform data Standard integrated BluetoothEZ-Start can help patients gradually adapt to their prescribed level of therapy using an innovative pressure acclimation algorithm with automatic, personalized adjustments to CPAP pressure over the first 30 days.SmartRamp allows users to fall asleep to lower pressures than standard ramp mode. The air pressure remains low until the patient experiences an obstructive respiratory event. Then SmartRamp responds with our patented auto algorithm to resolve the patient’s apneas. 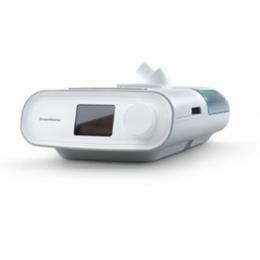 CPAP-Check Checks on the user every 30 hours to determine if CPAP pressure is optimal. If not, it automatically adjusts to meet changing patient needs.Auto-trial Delivers breath-by-breath auto-CPAP therapy for up to a total 30 days per patient. Transitions to CPAP-Check mode at end of Auto-trial.Opti-Start Provides optimal starting pressure that can improve patient comfort and reduce the likelihood of residual events at the beginning of therapy. Performance Check simplifies in-home device evaluation and can help reduce the number of normally functioning devices that are returned for service.